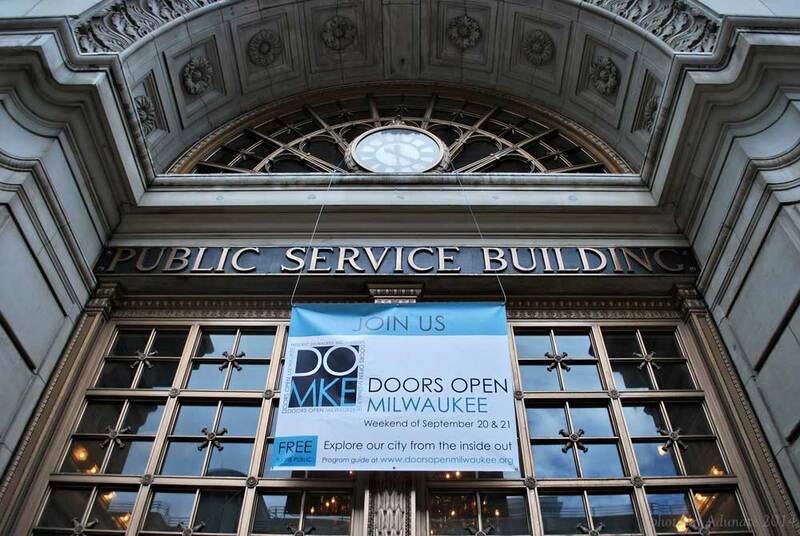 This past weekend more than 150 architectural gems of Milwaukee threw open their doors and let us, the inquisitive public, meander inside for a peek. They were all part of Doors Open Milwaukee, a Historic Milwaukee 2-day event that was loads of fun. There were so many interesting buildings on the list, I would have loved to stay in town and tour both days! Here’s one of the five we toured. So if your husband is a line mechanic for WE Energies, you for sure have to visit the Public Service Building. Well, you should no matter where you or your husband works just because it’s an absolutely gorgeous building. 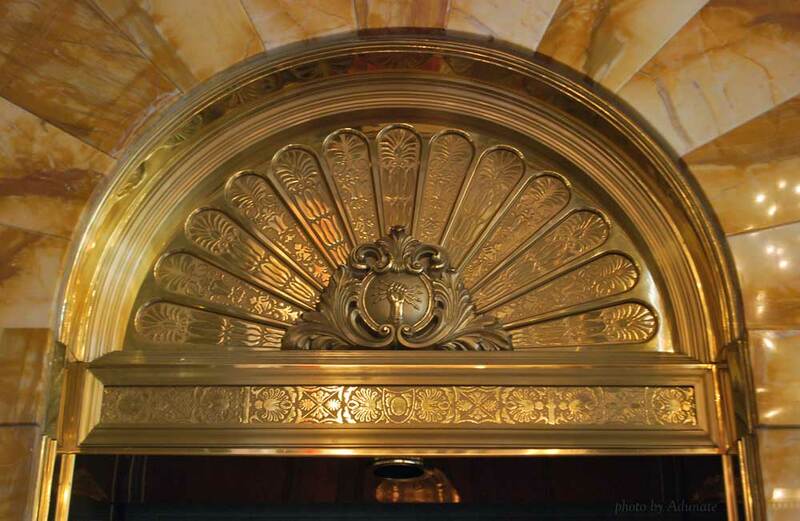 Completed in 1905 by the Milwaukee Electric Railway and Light Company, it’s an interesting blend of neoclassical and art deco design. As they say, design is in the details. Here, two elements consistently carry the design throughout the building: archways and the icon of a fist holding lightening bolts (it is a power company after all). 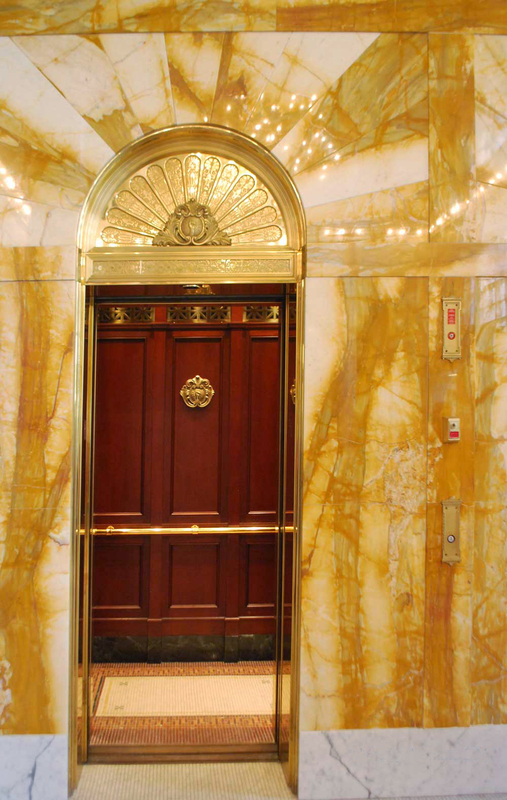 Imagine using this elevator for your work days. 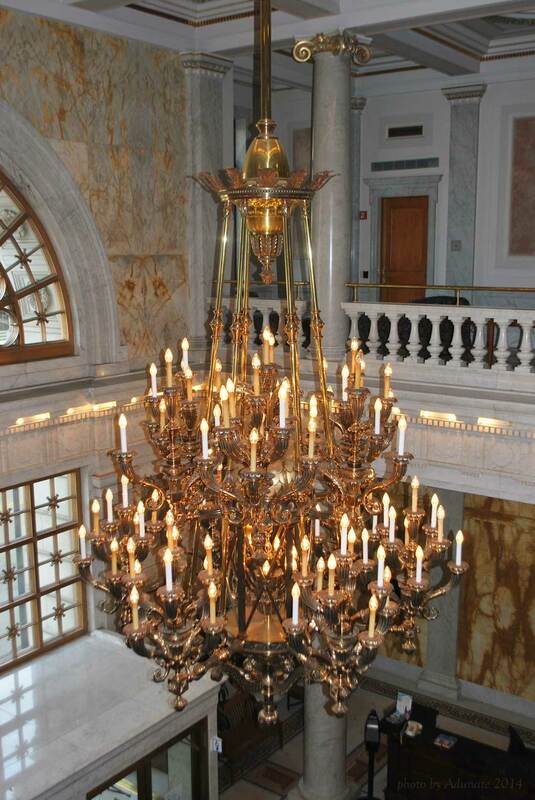 The chandelier mirrors the ornate Victorian details of the lobby. Another consistent element were the architectural keystones above the main archways. The informative and not-too-wordy guide pointed out how the marble is cut so each piece is mirrored to the one next to it. How’s this for a ceiling? This room is the auditorium, complete with a balcony and stage. 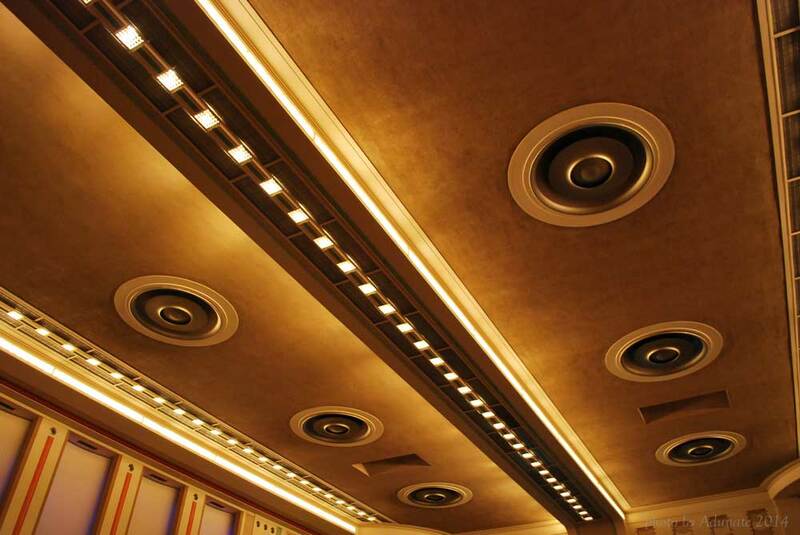 In the 1940s the company, by then known as Wisconsin Electric Power Company, gave much of the building an art deco makeover to go with the moderne style of the day. Yes, it’s a bit of contrasting ‘wow’ when you walk into this room. But it’s interesting nonetheless. WE Energies had a display set up here with their annual cookie books, a tradition they’ve kept since 1932. I’m proud to say I have nearly all of them from 1991-2013! I love how the designers married the art deco to the original style simply by bringing in the fist and lightening bolts. Consistency is key, even in contrast, yes? 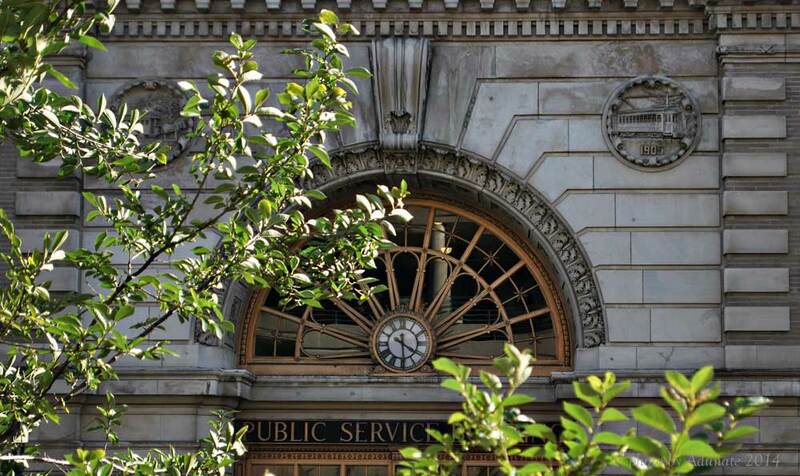 The Public Service Building was originally used as an interurban passenger depot and trains came right into the building through these doors. Nowadays trains are no longer part of Milwaukee’s public transportation and the building is used for WE Energy corporate offices. 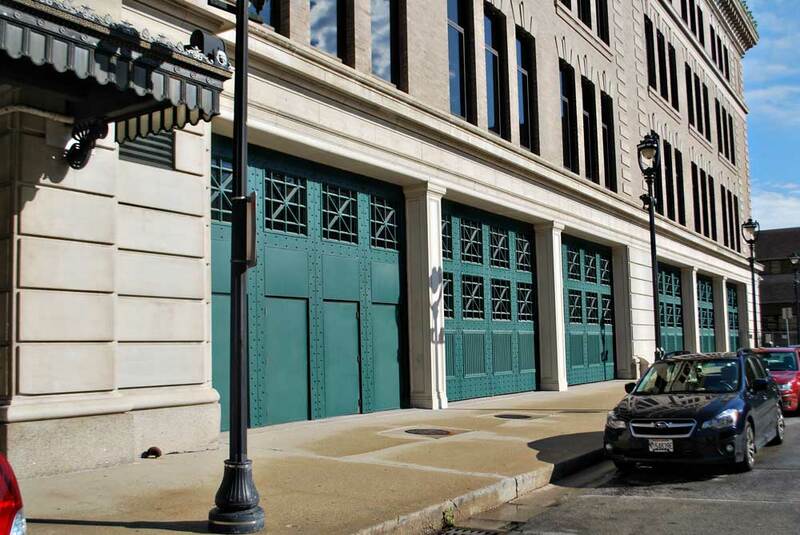 These doors are replicas of the original depot doors. 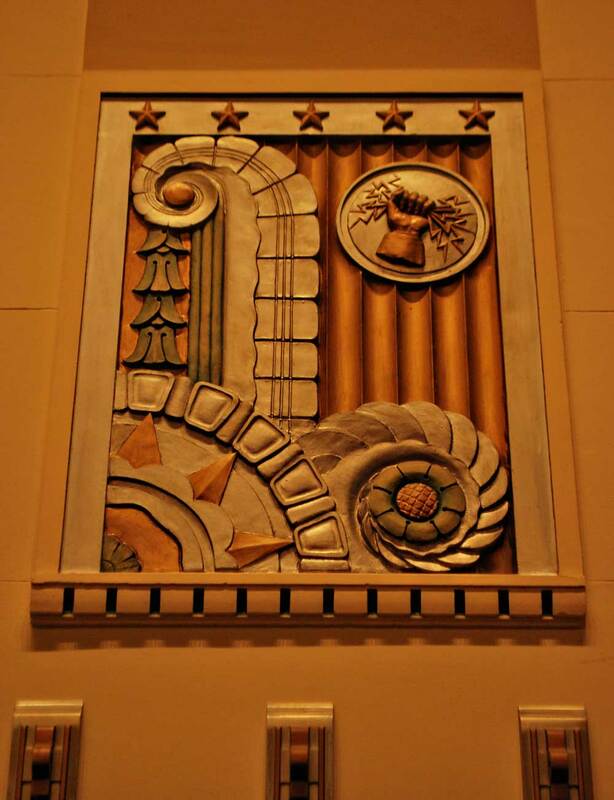 So there you have it, a sneak peak into one of Milwaukee’s notable buildings! 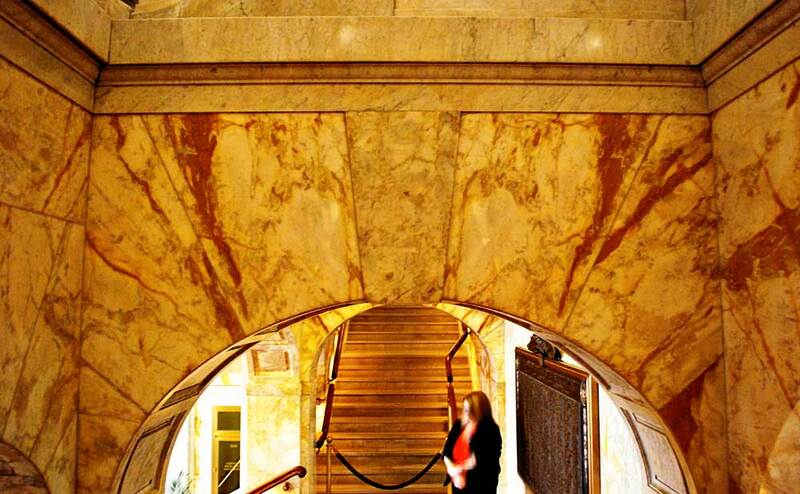 Stay tuned for our next stop: the Pfister!